For questions like this, we look outside of marketing to a discipline that is supremely well-practiced in changing tactics as soon as indicators go sour: financial trading. There are hundreds, if not thousands, of techniques for quickly spotting trends that require a rapid change in tactics. In this video, we’ll look at one of the most time-tested techniques and how to apply it to marketing data. For reference, the R library used in the video is the tidyquant library available on Github and CRAN. 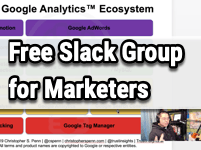 If you’d like the Excel workbook version of this, please join our free Analytics for Marketers Slack group. 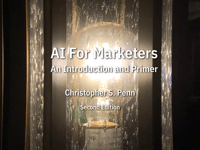 we can apply these same ideas and the same concepts to marketing data. And they actually work better in marketing. The reason why is that the stock market is so volatile. And the stock market has so many confounding variables that these techniques sometimes struggle in the stock market. But if you think about something like your web analytics, there’s no shadow website that’s secretly sending you traffic or things like that, right? It’s just your website, you own it. And and your data is your data. And our companies are compared to the stock market so small, and so not real time that these mathematical techniques shine brilliantly. So we’re going to look at a technique today called the moving average convergence divergence indicator. That is a mouthful, but what it basically means is that if we were to look at your Google Analytics data, here’s the number of users that have been to my website. about this is that you don’t need to wait for monthly reports or quarterly reports or anything, you can run this sort of data on a weekly or even a daily basis. If if you’re doing some high stakes stuff to very quickly figure out i think is going in the right direction or the wrong direction. change content tactics, maybe run a predictive forecast like what else are people talking about right now that we should be participating in to get this number back above zero.